ActBlue processes donations exactly how the contribution form is filled out when a supporter clicks the donate button. Each organization or campaign creates its own contribution forms, and some choose to set their forms to have the recurring option pre-selected by default. 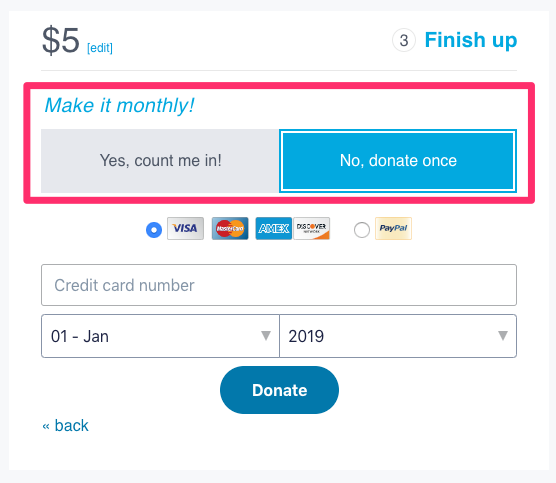 This can result in signing up for unintended recurring contributions if the "No, donate once" option is not manually selected. Our Customer Service Team is always available at info@actblue.com to help rectify an unintended recurring contribution, or you can follow these directions. To ensure that future donations do not accidentally recur, make sure the recurring box is not selected before submitting your contribution. If you have any concerns about the way a particular contribution form has been set up, you can reach out directly to the organization or campaign that created it.